Coenraad Jacob Temminck (Dutch pronunciation: [ˈkunraːt ˈjaːkɔp ˈtɛmɪŋk]; 31 March 1778 – 30 January 1858) was a Dutch aristocrat, zoologist, and museum director. Coenraad Jacob Temminck was born on 31 March 1778 in Amsterdam in the Dutch Republic. From his father, Jacob Temminck, who was treasurer of the Dutch East India Company with links to numerous travellers and collectors, he inherited a large collection of bird specimens. His father was a good friend of Francois Levaillant who also guided Coenraad. Temminck's Manuel d'ornithologie, ou Tableau systématique des oiseaux qui se trouvent en Europe (1815) was the standard work on European birds for many years. 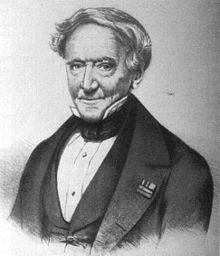 He was also the author of Histoire naturelle générale des Pigeons et des Gallinacées (1813–1817), Nouveau Recueil de Planches coloriées d'Oiseaux (1820–1839), and contributed to the mammalian sections of Philipp Franz von Siebold's Fauna japonica (1844–1850). Temminck, in collaboration with Heinrich Kuhl, is the author of descriptions of parrots, including the rosella Platycercus icterotis. A tailless mutant of a junglefowl Gallus lafayettii was described in 1807 by Temminck, which in 1868 the English naturalist Charles Darwin incorrectly denied existed. ^ "Coenraad Jacob Temminck (1778 - 1858)". Royal Netherlands Academy of Arts and Sciences. Retrieved 17 July 2015. ^ "Species: Platycercus (Violania) icterotis [complete]". Australian Faunal Directory. Department of Energy and Environment. Retrieved 28 October 2018. Taxonomic Decision for Subspecies Arrangement: Condon, H.T. 1975. ^ Grayson, Mike. "A ZOOLOGICAL "WHO WAS WHO"". docs.google.com. p. 14. Archived from the original on 2016-12-24. Retrieved 24 December 2016. ^ Beolens, Bo; Watkins, Michael; Grayson, Michael (2011). The Eponym Dictionary of Reptiles. Baltimore: Johns Hopkins University Press. xiii + 296 pp. ISBN 978-1-4214-0135-5. ("Temminck", p. 263). Wikimedia Commons has media related to Coenraad Jacob Temminck.